The December Christmas Party was held at Diamond River Steakhouse in Findlay, Ohio. There was not a formal meeting. There were 24 members and guests. Dinners were ordered and everyone settled into a couple of hours of polite conversation about Model T's and life's events. All of the projects that we are involved in are taking a little bit longer than we had expected. Some of us are just having a little trouble getting started. Jack keeps churning out completed engines, Bill keeps beating scrap metal into works of art, Sue and I are now involved in two clubs, Bob has settled into the snowmobile groove for the winter, and Denny is busy with live steam railroad restoration. I've decided to use this newsletter to make a few suggestions about what we can do to prepare our cars for the winter months. 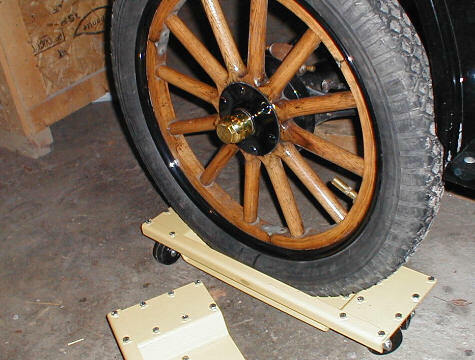 There's also a suggested fix of adding neoprene seals to the rear axles to early cars to help stop those pesky oil leaks. I've also dug up another picture of one of the 1914's. Those viewing the picture can use it as a "before picture" for our upcoming group weight reduction program. Officers will be elected at the January meeting. It is a blessing to serve and we should all be so blessed. Amen!! For many years I have searched for a practical way to use a neoprene axle seal on the early pre 26 axle tubes. A leather seal was used in 26-7 and provisions were made for it in the tubes. But there is not space enough to use these seals in the early axles. Yes, I know they have neoprene seals in the catalogs and they work fine in the late axles but in the earlier ones you have to grind off the axle sleeve to make room for them Take a look at the photo to see what I've done. The washer is a Ford part about .040 in thickness. There is room for it. The seal goes towards the differential inside the tube and the sleeve is put in place next. This is one of the pictures that Bob Hollister snapped while we were in Livonia, MI. 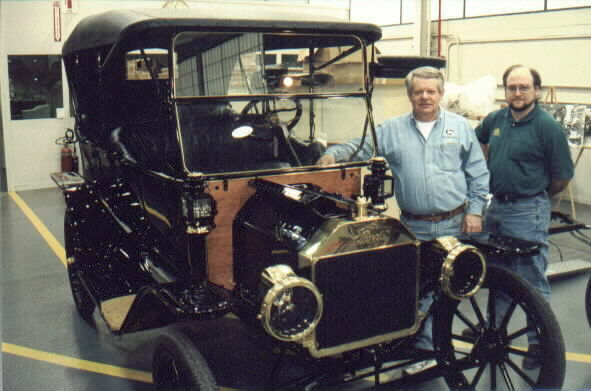 The Model T that we are standing next to is number 2 of the T100 project cars. Jack sent the picture to me with the title "potential owners". That's Jack Putnam on the left and Jim Cook on the right. My first suggestion would be to make sure that you have a 50/50 mix of antifreeze and water in the car. Now put on your parka, a warm scarf, a pair of lined mittens and go for a drive in the country every couple of weeks. "Oh what fun, it is to ride, in an open Model T". The community will now be convinced that you should be committed to the home. For those of you who are a little less adventurous, I would offer these suggestions. 1. Remove the battery to a dry workbench. 2. Drain the gas tank and carburetor. 3. Do an oil change. 4. Remove the plugs and add 1/2 tablespoon of oil to each cylinder. 5. Turn the engine over a couple of times. 6. Replace the plugs loosely in their holes. 7. Jack up the car to get the tires off of the ground. 8. Reduce the tire pressure by 10 pounds. 9. Drain the radiator or fill it with a 50/50 mix of antifreeze/water. The axle jack to the left is nested just under the ouside hub of the front wheels. By taking the weight off of the tires during storage, the tires are less likely to develop flat spots. 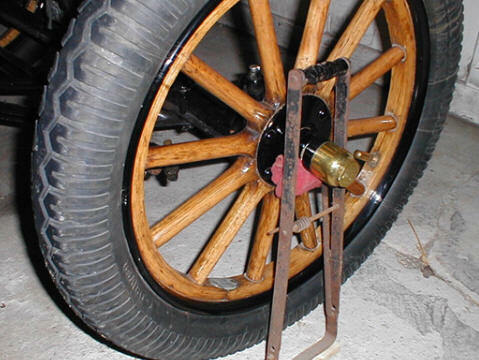 The other benefit is the relief of the pressure on the wooden spokes. 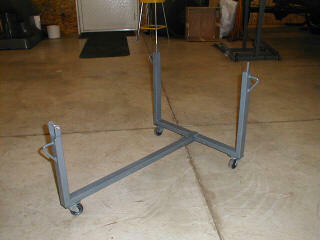 This axle jack is a simple device that locks into place with a little coiled wire on the horizontal bar. The tire is raised above the floor by a mere 1/2 inch. There is a second set of bottom holes in case the tire height needs to be adjusted higher.